Calgary Flames prospect Adam Ruzicka (19) burned his former team, scoring the game winner with 3:03 left in the third period as the Sudbury Wolves claimed their 30th win of the season, defeating visiting Sarnia by a score of 4-3. Sudbury’s fifth straight win included a pair of goals from 2019 NHL Draft prospect Blake Murray (21, 22) while Nolan Hutcheson and Quinton Byfield each collected two assists. Drake Pilon (9) also scored for Sudbury as the Wolves outshot the Sting 39-26. Down 3-1 early in the third period, Hugo Leufvenius (28) and Ryan McGregor (19) scored Sarnia goals to knot the score at three before Ruzicka netted the winner with assists from Owen Robinson and Cole Candella. 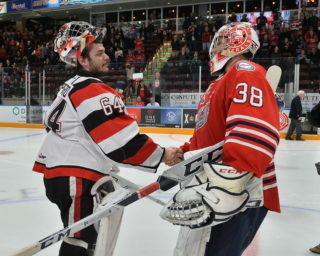 Franco Sproviero (17) also scored for Sarnia while goaltender Cameron Lamour made 35 saves. The Sting drop their seventh game in the past 10, falling to 21-23-5-2 for sixth place tie in the Western Conference. Sudbury improves to 30-16-2-1, eight points back of first place Niagara in the Central Division. The Owen Sound Attack snatched victory from the clutches of defeat as Barret Kirwin (13) tied the score with 1:21 remaining before Philadelphia Flyers prospect Maksim Sushko (12, 13) scored the overtime winner with 18 seconds to spare, giving the Bears a 4-3 win over visiting Windsor. Sushko’s second of the night came on assists from Trenton Bourque and Aidan Dudas, helping the Attack earn two big points to take a three-point edge on sixth place Kitchener and Sarnia in the Western Conference. Dudas (19) scored shorthanded and finished the night with a goal and two assists while Mack Guzda earned the win in goal with a 26-save effort. Chase Campbell (8), Jean-Luc Foudy (5) and Tyler Angle (15) scored Windsor goals while Colton Incze earned second star honours with 27 saves. The Spits fall for the eighth time in the past 10 games, seeing their record sit at 21-27-3-1, four points up on ninth place Erie in the Western Conference. The Attack improves to 24-22-2-2. 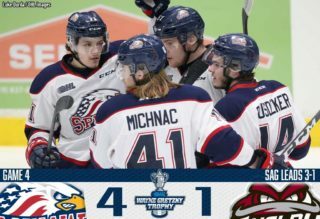 The Saginaw Spirit overcame a 2-0 deficit, roaring back to beat the Flint Firebirds 6-4 on home ice as Albert Michnac (14), Camaryn Baber (5) and Mason Millman (3) each had a goal and an assist. The Spirit carried the play, outshooting Flint 53-37 as Blade Jenkins (19), Cole Coskey (28) and Cole Perfetti (22) also got on the board. Jake Goldowski picked up a pair of assists and rookie goaltender Tristan Lennox made 33 saves as Saginaw improved to 32-14-2-2, just two points back of first place Sault Ste. Marie in the West Division. Flint had a pair of goals from draft eligible forward Ethan Keppen (19, 20) while Jacob Winterton (9) and Eric Uba (17) also found the back of the net and Dennis Busby picked up two assists. Sophomore netminder Luke Cavallin made 47 saves in the Flint crease as the Firebirds dropped their fourth straight, falling to 9-40-3-0. The Oshawa Generals and Peterborough Petes combined for half as many goals as they did on Friday as the Generals took a 6-3 road win. Colorado Avalanche prospect Brandon Saigeon (31, 32) scored twice, bringing his career total to 100 while Allan McShane (23), Danil Antropov (13), Cole Resnick (4) and Nicolas Mattinen (16) also lit the lamp. Boston Bruins prospect Kyle Keyser rebounded from Friday’s contest to turn aside 29 shots while Generals captain Kyle MacLean earned two assists. Petes overager Chris Paquette (22, 23) scored twice while Liam Kirk (18) opened up the scoring just 1:03 into action. The Generals pick up their 30th win, improving to 30-18-2-0 with their seventh win in the past 10 games. Peterborough falls for the eighth time in the past 10, dropping to 24-24-1-1 for sixth in the Eastern Conference. The Erie Otters recovered from a 4-2 deficit early in the second period, surging ahead with four straight goals to take a 6-4 lead before managing to hold off the host Hamilton Bulldogs by a score of 8-7. Rookie forward Brendan Hoffmann (7, 8) recorded a career high four points with two goals and a pair of assists as the Otters earned their 20th win of the season. Alex Gritz (6, 7) and Gera Poddubnyi (22, 23) also scored twice for Erie while Mathew MacDougall and Chad Yetman both picked up a pair of assists. Emmett Sproule (8) and Danial Singer (15) rounded out the Erie scoring as the Otters struck for eight goals on just 23 shots. Hamilton outshot Erie 38-23 as Arthur Kaliyev (37, 38) led things offensively with two goals and an assist. The trio of Jan Jenik (4), Matthew Strome (22) and defenceman Cameron Supryka (1) each had a goal and two assists while Isaac Nurse (10) and DJ King (2) rounded out the Hamilton scoring. The Otters pull to within four points of a playoff spot in the Western Conference sporting a 20-27-1-1 record. Hamilton drops a third straight, falling to 23-24-3-1. 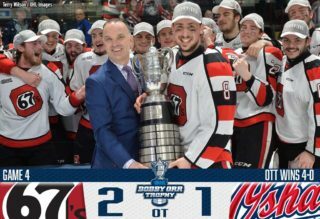 A showdown of two Eastern Conference titans went the way of the host Ottawa 67’s as OHL scoring leader Tye Felhaber (52, 53) had two goals and an assist in a 6-1 win over the visiting Niagara IceDogs. San Jose Sharks prospect Sasha Chmelevski (19, 20) also scored twice while Kyle Maksimovich (29) struck shorthanded and Graeme Clarke (17) added a late power play goal. Ottawa’s power play went 3-for-8 on the night as the 67’s outshot the IceDogs 40-26. Michael DiPietro turned aside 25 shots, surrendering Niagara’s lone goal off the stick of Jack Studnicka (21) on the power play. Ottawa’s eighth straight win improves the 67’s to 38-9-3-1, good for a nine point cushion over the second place IceDogs in the Eastern Conference. Niagara’s eight game winning streak draws to a close as the IceDogs fall to 32-11-7-0. Rookie netminder Jet Greaves shut the door again, turning in his second 50-save performance in as many nights as the Barrie Colts edged the visiting Mississauga Steelheads 3-1. Aidan Brown (9), Ryan Suzuki (17) and Sam Rhodes (7) provided Barrie goals as the Colts were outshot 51-23 but managed to come away with two points for head coach Dale Hawerchuk’s 300th career win. While Greaves was the game’s first star, Suzuki took secondary honours with a goal and two assists. Mississauga’s Nick Isaacson (10) broke up Greaves’ shutout bid with 8:06 left in the third period, one that saw the Steelheads outshoot the Colts 19-4. Barrie rebounds from a shootout loss on Friday to improve to 21-25-2-1, four points back of a playoff spot in the Eastern Conference. The Steelheads fall to 23-21-5-1, two points up on Peterborough and Hamilton for fifth in the Eastern Conference. Nineteen-year-old defenceman Riley Coome (1) scored his first OHL goal at the perfect time, netting the game winner as the London Knights took down visiting Kitchener 4-2. Coome’s first goal in 94 career games came with assists from Connor McMichael and Adam Boqvist as the Knights extended their winning streak to six games. 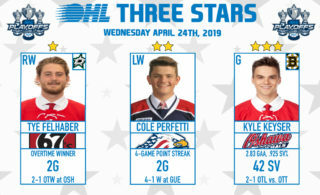 Reigning OHL ‘On the Run’ Player of the Week Liam Foudy (28) extended his point streak to 13 games with a goal while Boqvist (12) and Alex Turko (3) also found the back of the net. Kitchener’s Lucas Pfeil did his part, turning aside 38 shots while Ranger goals came from Greg Meireles (23) and Riley Damiani (20). London outshot Kitchener 42-26 as Vegas Golden Knights prospect Jordan Kooy picked up the win in his first start since Jan. 8th. London leads the Western Conference by eight points, improving to 36-7-5-1 while Kitchener sees a three-game winning streak snapped, falling to 23-23-3-0. It was all Guelph Storm in Kingston on Friday as Dallas Stars prospect Liam Hawel (26, 27, 28) scored a hat-trick in an 8-1 road win. Rookie forward Ty Collins recorded three assists while Cedric Ralph (14), Markus Phillips (3), Zack Terry (1), Domenico Commisso (6) and Cam Hillis (10) added singles for the Storm. Guelph outshot Kingston 41-13 and went 2-for-2 on the power play as Nico Daws picked up the win in goal. Kingston’s lone goal came off the stick of Dawson Baker (7) with 3:31 left in the third period. The Storm keep rolling, continuing a five game point streak to improve to 27-13-6-4, four points back of third place Saginaw in the Western Conference. Kingston drops an eighth consecutive contest, falling to 12-38-1-0.